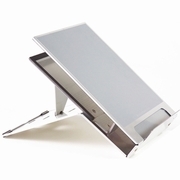 Bakker Elkhuizen Ergo-Q 260 Portable, Aluminum Notebook Stand and Riser. Exponentially over the past few years more and more desktop computers are being replaced by laptop computers. This being said, the practicality of using a laptop for extended periods of time from an ergonomic point of view, is not desirable. Due to the low positioning of the laptop screen and the fixated keyboard, most laptop users maintain a hunched-over body posture while working. Intensive laptop use therefore can cause serious musculoskeletal pain and injuries (Oh My Aching Laptop Study) . The Ergo-Q260 provides the perfect solution! 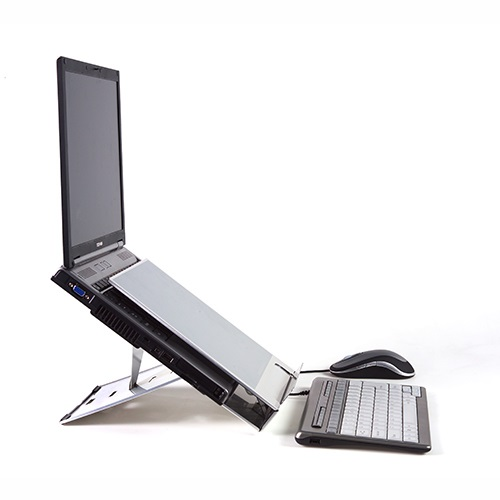 The Ergo-Q260 allows the laptop screen to be adjusted to the correct viewing height and depth for the user, encouraging both a comfortable and safe posture. The Ergo-Q 260 also includes a document holder, which conveniently positions documents just below the laptop screen to minimize undue head and neck motion. In combination with a separate keyboard and mouse you can easily create an ergonomic workstation anywhere you go. Use the Ergo-Q260 at the office, at home, or while traveling on business. Improves body posture and comfort level. Decreases neck torque, increases comfort and productivity. Ideal for FlexSpace & Home Office Tele-work. Depth (front to back): 12.2"
Height (deployed at lowest setting): 3.5"
Height (deployed at highest setting): 8.3"
Height (folded for transport / storage): 0.3"
Range of adjustment (height at back of unit): 4.75"